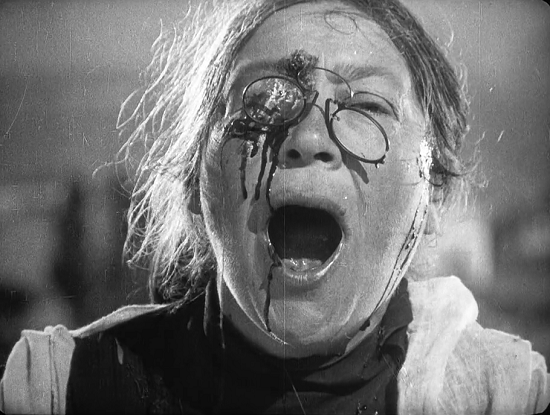 Battleship Potemkin is the film that defined film grammar for decades to come and one of the central influential films in the history of Cinema. It set the foundation for both artistic and technological endeavors for the past 80 years of cinema. And, it also reinvented the editing process known as 'Montage' by the juxtaposition of images. The editing and music is so overpowering that you forget that it's a silent black and white movie. 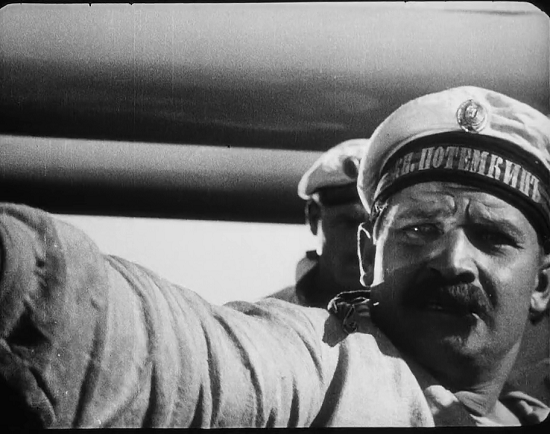 A revolutionary film in form, in political purpose and in subject matter, Eisenstein's 1925 Soviet classic focuses on a naval mutiny in the Black Sea during the abortive 1905 revolution. This great 20th-century icon is up there with Guernica, the work of another communist maverick who put his art at the service of the revolution, though unlike Eisenstein Picasso was never disciplined by anyone resembling Stalin and his philistine cultural commissars. Besides being a cinematic landmark, it is also a gripping account of the massacre at Odessa. The film's 75 minute duration is composed of 1,400 takes and is the precise model of its innovatory director's theory of montage. Potemkin is a vital viewing experience that transcends its landmark/milestone status. Its virtuoso technique remains dazzling and is at the service of a revolutionary fervor we can still experience. You get the feeling that the film is in constant motion and it still carries the power to enthrall anyone- exciting, gripping and still admirable. The 'Odessa steps' sequence, probably the most famous sequence in movie history, is nothing short of brilliant, it has been copied many times, most notably in Depalma's 'The Untouchables'. Brothers! Do you realize who you are shooting? The film celebrates the limited 1905 Revoultion against Tsarism in Russia. 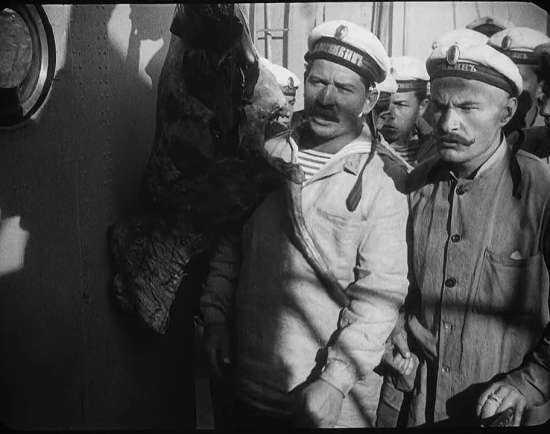 Sailors on the Battleship Potemkin begin to rebel when they are given maggot-infested food to eat. The ship's captain orders those who protest to be shot on deck, but sailor Vakulinchuk asks, "Brothers! Do you realize who you are shooting?" The shooting squad lowers their rifles, and mutiny on the ship begins. The sailors attack the officers and gain control of the ship, although Vakulinchuk is killed by a senior officer. The sailors take him to the port city of Odessa, where his body serves as a symbol of those who would give their lives for the revolution. There, the martyred Vakulenchuk's body lies in state where thousands of citizens come out to pay their respects. The people supply the sailors with food and the ship starts to sail off. Many are gathered on the steps of Odessa when, suddenly, a tsarist militia arrives to quell the crowds gathering to see the dead sailor and begins firing into the crowd. Shots ring out, and thousands die under Czarist rifles. The battleship responds by firing at the headquarters of the tsarist generals located nearby onshore. A squadron has been sent out against the Potemkin, and the sailors decide to sail out and face it. Two battleships approach and the Potemkin readies its cannons but sends up a signal, "Don't fight—join us." On the verge of a battle, a title reads, "Brothers! ", and sailors on all of the ships begin celebrating. The Potemkin and its jubilant crew pass without being attacked and with added support. Sure, this movie is one long propaganda piece from start to finish, but it is an amazingly effective package of lies. The importance of class appears in the movie right from the start, when we see the sailors interact with the smug Czarist officers on the ship. The outpouring of citizens from the city to see Vakulenchuk's body turns into a recognition of class-consciousness by the outraged proletariats, who yell slogans like "One for all" and demand the ouster of the Czar. When the soldiers appear and begin to kill the people, we see Eisenstein in his element. These scenes are simply remarkable in the sheer emotional power of the murder of a young boy and a baby killed by a sword wielding Cossack. Close up shots of faces awash in ecstasy over the coming together of the crowd quickly contrast with the same faces expressing sheer horror over the slaughter of thousands of innocents. All of this cinematic glory is held together with a Shostokovich score of epic implications. You even get a slap at the Church in the form of a malevolent looking priest tapping a crucifix against the palm of his hand as the officers on the Potemkin form a firing squad. Few films pack this type of dramatic punch. Eisenstein is considered one of the early pioneers of the montage editing theory. He encapsulates this process throughout Potemkin by metaphorically editing dissimilar shots together. At the beginning of the film, we see a prolonged sequence of waves crashing upon a dock and rocks. The edits are quick, repeated and full of movement. 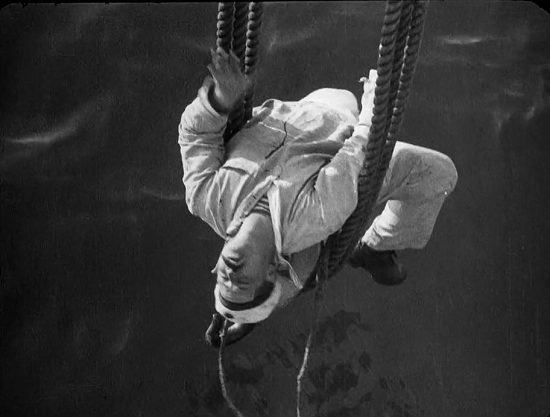 Eisenstein's purpose in this approach was to demonstrate, through montage, what kind of friction and collisions the film would contain in story, character development and even the editing itself. 'He reveled in the possibilities of juxtaposition, placing images in rhythmic succession to create meaning (in theory) and powerful feelings (in practice)' (Hilditch). The film moves on to the Battleship and its crew. We see the unjust treatment of the sailors by the commanding officers in the form of verbal abuse and a lack of a good supply of food. 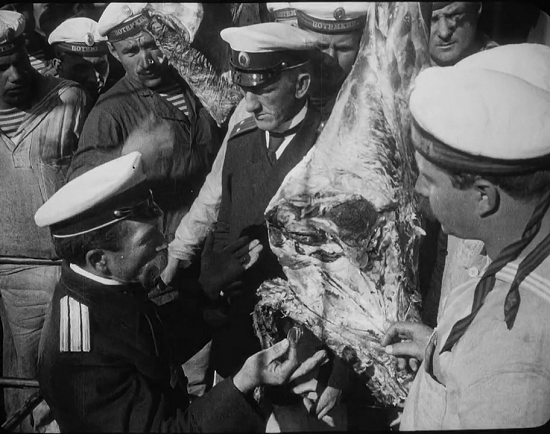 The juxtaposition of images of raw, spoiled meat and the growing tension among faces of the crew members leads viewers to support the sentiments of the sailors. As the uprising on the Potemkin begins, there are clear suggestions as to the unworthiness of the officers. We see several shots of the ship's doctor, who is a small man, and at first the shots are from below him, where he seems to have a sense of authority. But, as the sailors gain confidence in their rights, the shots of the doctor eventually change to him at the bottom of a staircase and then off the edge of the boat. The same is true with the ship's priest, who despite his frightful appearance, seems to lose his place of honor as he lowers his cross as a weapon. The news of the mutiny reaches the Odessa shore when Vakulinchik, the mutiny's leader is killed and transported to shore in an almost royalty form. The most memorable sequence in the movie is when the people begin to arrive to observe the dead body of Vakulinchik. Eisenstein takes nothing more than shots of crowds walking toward the docks from all corners of the city, but he makes it so compelling it gives you goose bumps. Or as Nick Hilditch of BBC says: "The effect of this triumph of tempo over plot is an audience ready to yell out 'Death to the oppressors!'" The sequencing of the march to the shore gives the audience a sense of wishing to join the crowd, even though the crowd is on screen. The editing of this scene (not to mention the amount of people Einstein recruited) gives you the feeling you are the only person who has not joined the fight. The next part of the movie is the considered one of the most famous in film history. 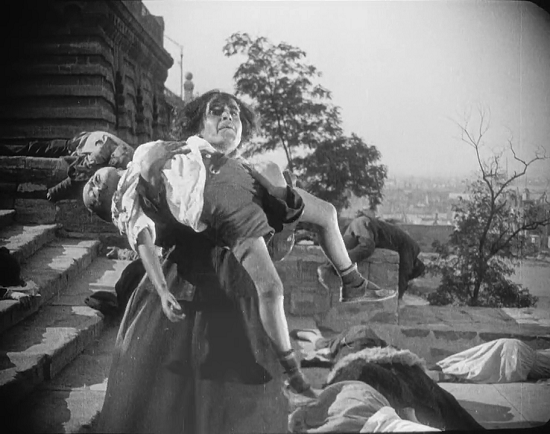 The Odessa Steps massacre, invented by Eisenstein and his collaborators, is one of cinema's greatest single sequences, and although the revolutionaries are the collective heroes, the key victims of the tsarist killers are all established as individuals before the shooting starts. The 'Odessa Steps' is essentially the "show of horror, violence and savagery where innocents are slaughtered and the spirit of the people is both temporarily quashed and inevitably martyred" (Paulapalooza). Eisenstein demonstrates the harsh rule of the monarchy in this quick, epic battle sequence that takes an uprising to an exciting level and then unjustly has them crushed by an impending army who "has no faces" , Roger Ebert says. Eisenstein accomplished this fiction battle so well that Roger Ebert, a revered movie critic of our time, states. Eisenstein, in concentrating those killings and finding the perfect setting for them, was doing his job as a director. It is ironic that he did it so well that today the bloodshed on the Odessa Steps is often referred to as if it really happened. The tempo generates a rhythm for each image in a timely fashion, which strikes the retina of the audience at the right moments to provide the strongest possible effect on the audience. Eisenstein accomplishes his goal so well mainly because of his technique. His sharp and rigid contrasting of lines and images he maintains throughout the sequence is a landmark of visual editing. It is brutal, horrific and most of all unforgiving. Einstein wanted to make his opinion known, and his blunt editing made that possible for him. Several scenes display a number of ideas through a montage where the audience can observe a number of powerful symbols in regards to the uprising. However, the editing would not be what it is if it was not for the tempo of the editing. 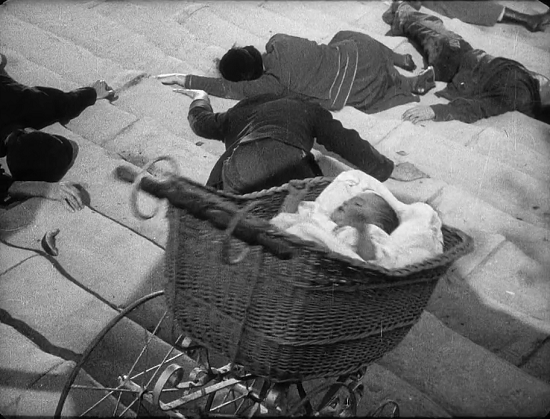 Battleship Potemkin is one of the cinematic masterpieces of all time, and rightfully so. 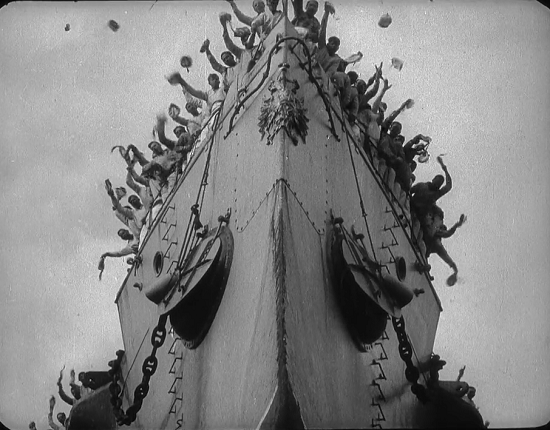 Despite its political intention, Battleship Potemkin offers an interesting notion in regards to humanity, which Eisenstein brings out through his skillful direction. The film also offers a truly brilliant cinematic experience through the exceptional montage. All of the cinematic components make it look much like a modern film, which the audience might see in the theater. Yet, the silence, the musical score in the background, and the black and white film raise the awareness in the audience that this film has earned it's well deserved spot in film history as one of the best films ever made.